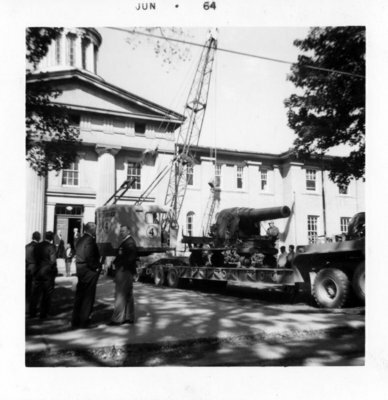 A black and white photograph of a cannon being moved from 416 Centre Street South. The Courthouse cannons were installed at the Citadel in Halifax in 1879 and were declared surplus in 1902 when Colonel John Edwin Farewell, Ontario County Clerk, acquired two for the Ontario County Courthouse in Whitby. In 1964, the County moved to a new building at 605 Rossland Road East and the cannons were shipped there on a flatbed truck. On July 8, 1989, they were returned to the Citadel in Halifax. This picture shows the north cannon leaving the courthouse. 416 Centre Street South, June 16, 1964, Brian Winter. Whitby Archives A2013_004_003.